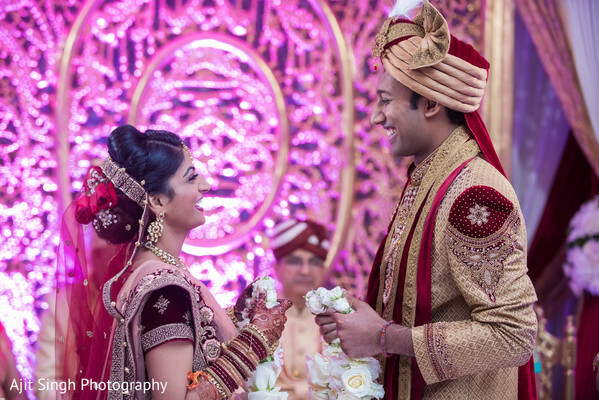 The wedding celebrations of Nirali and Aashish were at full blast with the elegant ceremony! 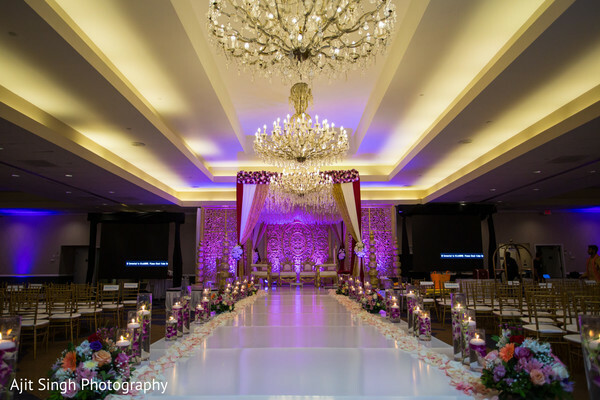 Carefully planned by Pearls Event and Co, the sought-after planning firm produced an amazing extravaganza in the sprawling halls of the Sheraton Parsippany Hotel! 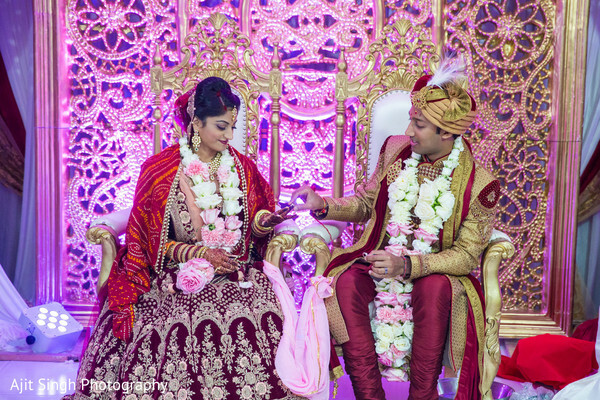 Nirali Decor intervened with a vibrant and upscale décor that included a majestic carved ceremony backdrop and a marvelous mandap with an astonishing bed of flowers! 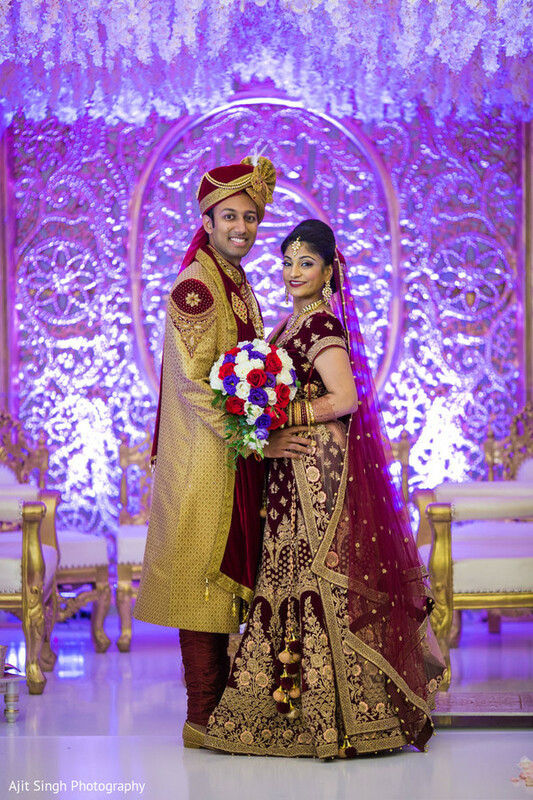 In addition, the uplighting brought in the color to the ceremony and created the perfect atmosphere. 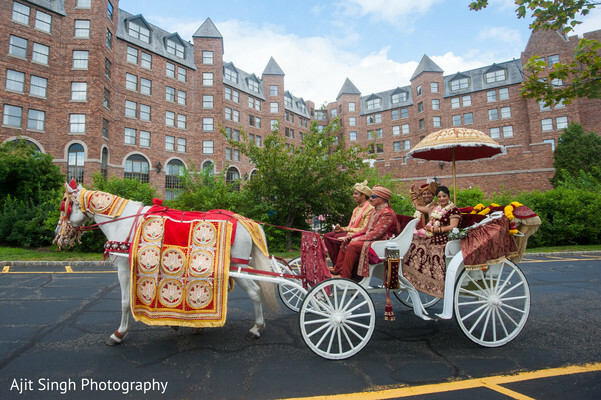 Raja Aashish arrived at the celebration leading a joyful procession and left the venue with her beautiful wife in a horse-drawn carriage! 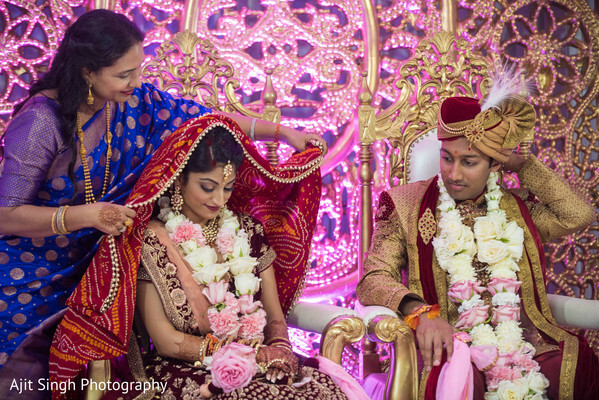 Once more, Ajit Singh Photography snapped every important scene and translated all the magic of the marriage rites into a beautiful series of images to feast your eyes! 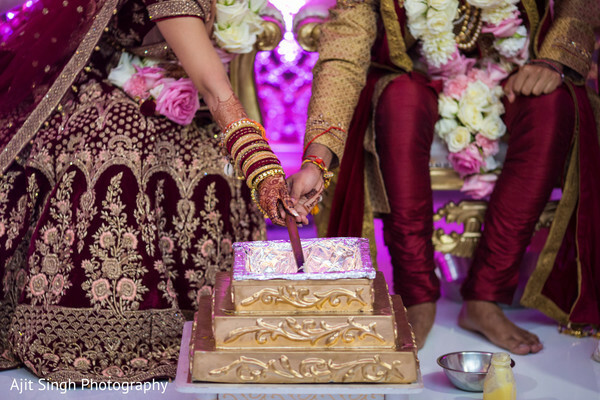 Please indulged yourself watching the pretty pictures in our full gallery! I met Aashish the first day of undergrad at Northwestern. We immediately formed a connection that made me feel so happy to be around him. We were part of the same friends' group for a few years before our relationship spontaneously developed into something more. A few weeks before graduation, he asked me to be his girlfriend and I couldn't have been more excited to say yes. I knew he was the one pretty early on in our relationship when we started doing long distance. He would spend late Friday nights after work flying from Houston to Chicago just to spend a weekend together. One Thursday night, we were face timing each other and he noticed I was having a rough week in medical school. The next morning, I woke up to him by my side. Without me even saying anything, he knew how I was feeling and exactly how to fix it. I knew that day that he was the one I wanted by my side through it all. 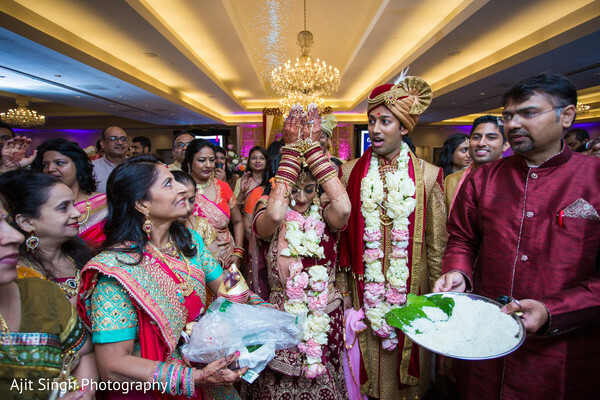 While I was finishing medical school with a few international rotations abroad, Aashish individually reached out to each of my family members and friends to help coordinate the proposal day. The day after med school graduation, my parents convinced me that we were doing a family photo shoot on my undergrad campus in Evanston before moving back to New York City. When I walked out onto the pier were our "photoshoot" was supposed to be, I noticed that my brothers and parents had disappeared from my side and the only person standing in front of me was Aashish. He was standing exactly where he had asked me to be his girlfriend four years prior. Right after he got on one knee, I noticed we were surrounded by our family, cheering him on to pop the question. Just when I thought it was over, he drove me to a cute restaurant where all of our friends were waiting to celebrate our big news! Honestly, a lot of the major planning credit for our wedding has to go to my siblings and cousins. I come from a huge family, and a lot of us got married this year. Particularly, my oldest brother and my cousin. We all put our heads together and found the best venues and vendors in the area. It was so much fun thinking of different themes we could all use and sending each other pictures of how we each imagined our big days to be. Before I knew it, we had all planned our own events in a unique way to represent each of our relationships. My mother in law was the pillar behind my wedding dress shopping. We went to Delhi the December before the wedding. We took 6 days to shop as much as we could and find the perfect dress for me. After trying on hundreds of dresses, I found one that just felt right. I honestly did not start shopping with a specific color in mind, but definitely wanted to keep things semi-traditional with the red theme. I planned the wedding in my first and second year of residency, which made the entire process pretty challenging. Most of our meetings with coordinators and venues happened when I was post-call and sleep deprived, which made for some pretty interesting ideas on my end. 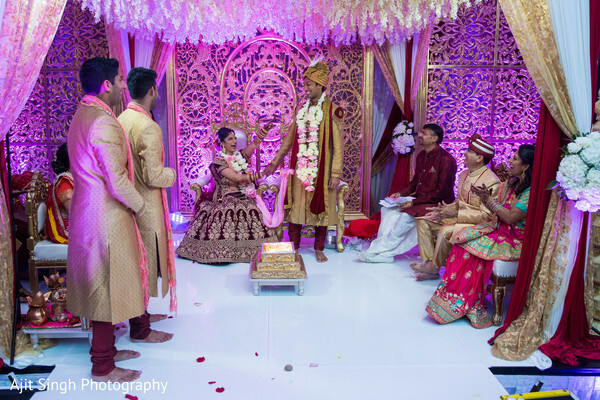 But towards the end of the process, I realized how much fun it was to fill my free time hanging out with my family members and Aashish to plan our big day. It would make my residency calls better because I was looking forward to all the excitement waiting for me at home. I think our guests really appreciated how personalized our wedding was. 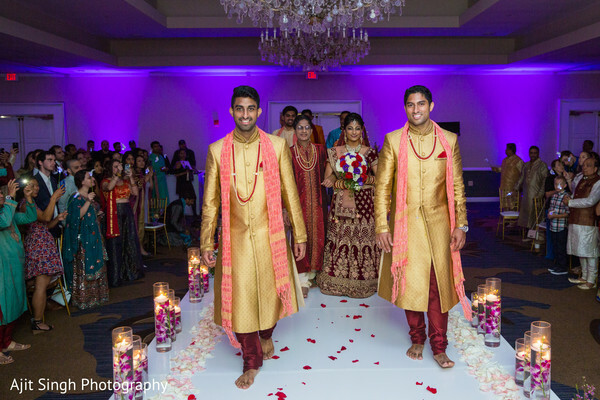 Aashish and I love to dance and travel and we made sure that was obvious in each of our events. We also love our undergraduate university (Go U, NU!) so I made sure to add subtle hints of purple in things like my bouquet and wedding dress. Every step of the way, we thought about how we could make our wedding unique to the two of us and our relationship and I am glad that came across to our guests so elegantly. Whenever I think back to the wedding I imagine the moment towards the end of the ceremony where we were sitting at the mandap with our parents and siblings. I remember looking out into the audience and seeing so many people we love there to support us on our big day. My heart was so full. Sangeet: we did a fusion sangeet/garba to combine the North Indian/Punjabi culture with Gujurati traditions. The first half of the event was all dances. We made sure we had all of our friends and family participate in the dances somehow, even if it was just for a few seconds. This made the entire event so fun for everyone because so many people had a chance to show off their talents and also show us how much they love us! You could really feel the high energy in the room throughout the night and we loved that. Reception: our reception theme was travel. Nirali decor worked so hard to transform the ballroom into a midnight sky so people could feel like they are taking a flight through the clouds. We dropped small hints of travel in the cocktail area with portraits of me and Aashish at our favorite destinations around the world. Everyone's seating arrangements were placed on gold airplanes as well, so that really tied the travel theme together. Take it easy and remember that this day isn't just a party you are throwing for others. It is the day you are starting a new chapter with your soulmate. If you sit back and let others take care of the little things, it will make the day so much more meaningful for you. I remember the hour before walking down the aisle so clearly. I was just hanging out with my brothers and bridesmaids in our getting ready and we were having a blast just living in the moment. Our cake was in theme with the rest of our reception, which was travel themed. We had the cake decorators fondant a map of the world on one of the layers of the cake. See pictures for details! M4U Events and Pearls Event and Co. are members of the Platinum Guide. Love what you see? Explore their portfolios.